Demolition Exeter: Dix's Field: "Only Ruin, not Annihilation"
Dix's Field above was another incomparable piece of Georgian Exeter: 24 red-brick townhouses designed by Matthew Nosworthy and situated in Southernhay in their own private pleasure ground. Along with Bedford Circus, the terraces on Southernhay West and the incomplete Barnfield Crescent, the development at Dix's Field is often regarded as the city's finest late-Georgian architectural scheme. 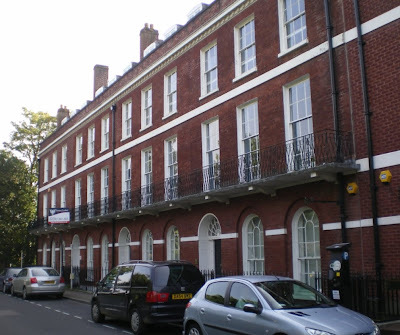 It was buildings like these which, according to the city's post-war town planner, Thomas Sharp, "made Exeter an architecturally important city". Of the original 24 houses at Dix's Field only three now remain. Work started in 1805 and continued for at least 15 years on a site once belonging to William Spicer Dix of Exeter which Nosworthy picked up in 1799 after Dix was forced into bankruptcy. It was a prime location, close to the fields and orchards which still surrounded Exeter to the south-east, with its own supply of fresh water and within spitting distance of the exclusive new terraces that Nosworthy had recently completed in Southernhay West. A house and garden already existed on the site. By the 1820s 24 houses had been finished, a row of seven in the north terrace and a row of seventeen in the south terrace opposite. It was never completed and ten more houses were presumably planned for the northern terrace. The wide area between the two terraces was landscaped with trees and lawns, and Nosworthy himself chose to live at No. 2 Dix's Field. The photo above right shows the three remaining houses out of the 24 built. The house at the far end was completely reconstructed after World War Two, so it could be argued that four actually remain. There are several interesting differences in Nosworthy's work at Dix's Field compared with his slightly earlier 18th century townhouses in Southernhay West. Most of the houses at Dix's Field were still three bays wide and spread over five floors, although the end houses were wider with an extra bay added to the right of the entrance. But now the rusticated Coadestone surrounds of the arched entrances in Southernhay West have been replaced with a simple moulding, with white-painted wooden panelling framing the front door itself. Gone too are the decorative sculptural keystones. 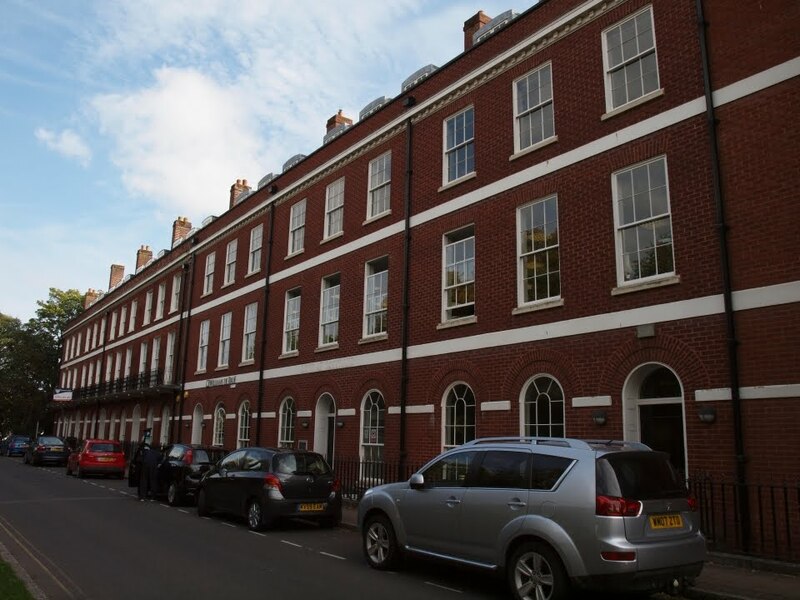 The white string course of Coadestone seen in Southernhay West has been raised a whole floor, dividing the second and third storeys across the entire face of each terrace, as does a light wrought-iron window guard at first-floor level. The photo left shows one of the surviving townhouses in Dix's Field. Other architectural details remain the same, such as the second smaller band of Coadestone which divided the windows and entrances at ground-floor level, the modilion cornice under the roof line, the use of arched openings for the ground floor windows, ornate fanlights over the entrance door and the cockloft windows in the roof partially hidden by a brick parapet. Despite the homogeneity of the exteriors, all the interiors were custom-designed to the wishes of the owners and so no two houses were identical. Guarding the entrance into Dix's Field were two delicately wrought-iron lamp standards in the shape of an obelisk. No. 1, Dix's Field, shown right c1920 stood on the corner of Dix's Field with Southernhay East. It is just visible in the photograph top to the far left. Not designed by Nosworthy, it's probable that No. 1 Dix's Field was already in existence when the first of the red-brick townhouses was built. 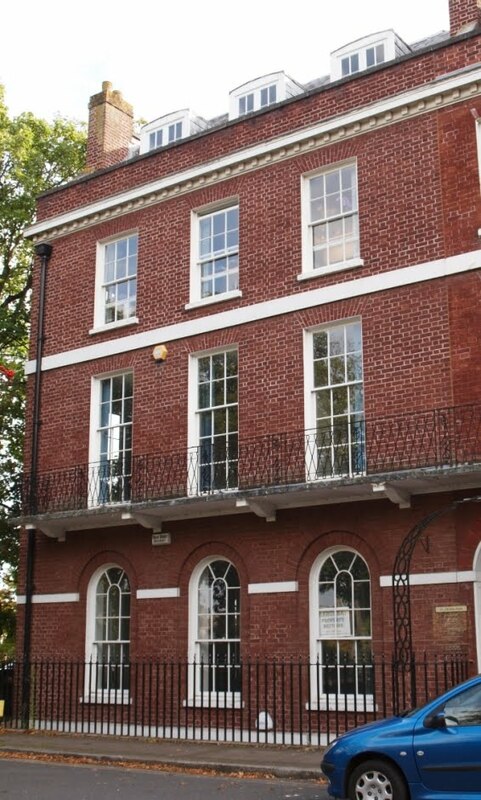 This large Regency house from c1800 with a slightly later extension was for many years believed to be the birthplace of the Rev. Sabine Baring-Gould, a well-known Victorian antiquarian and author of the hymn 'Onward, Christian Soldiers'. It is now thought that he was actually born at Chichester Place, a nearby terrace of slightly later townhouses (his birth certificate states he was born at "1 Chichester Place" although there is some evidence to the contrary). Unfortunately No.1, Dix's Field was destroyed in 1942. It's worth repeating that before 1942 Exeter had one of the finest collections of provincial Georgian architecture in England. 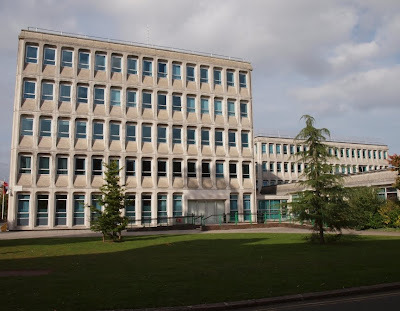 Today Exeter is an architecturally nondescript city, a few fragments and the cathedral excluded, but the eventual fate of Dix's Field was typical of the post-war mindset. In May 1942 Dix's Field was badly damaged by incendiary fires spreading from Paris Street. The city council's conservation report for Southernhay states that, in Dix's Field, 'much was lost to bomb damage' but there's a lot more to the story than would appear on the surface. Out of the 24 original red-brick townhouses, six survived totally unscathed, three on the south side and three on the north side. One single house was totally destroyed. 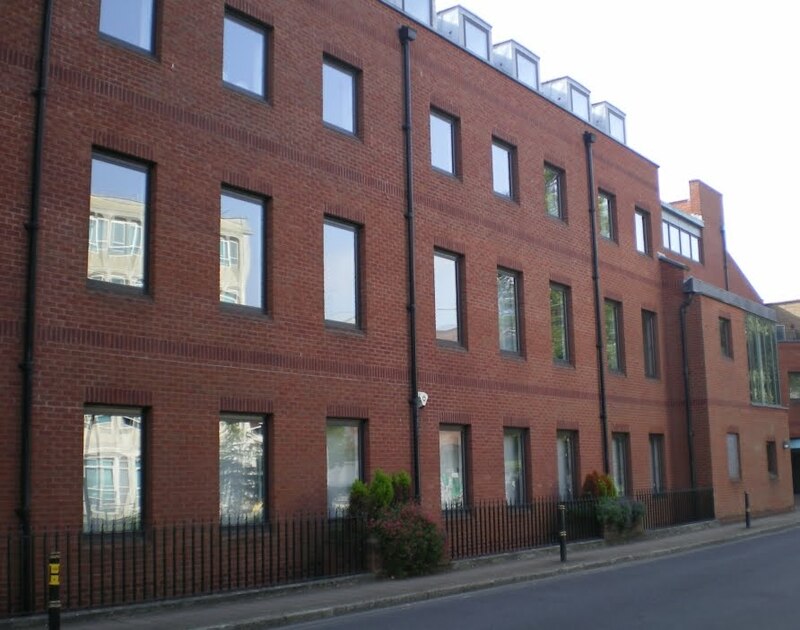 Shown right the facade was, miraculously for Exeter, rebuilt relatively successfully from scratch. By far the most damaged of the townhouses it was also the only one to be restored and survives today as an illustration of what was possible if the mentality of the local authority had been different. The remaining seventeen properties were gutted by fire, losing their internal floors and roof, but with the outer walls and facades left intact. 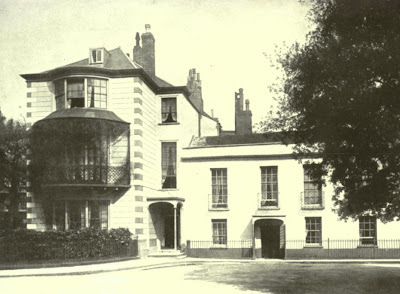 Even Thomas Sharp, the town planner employed by the city council to create a plan for rebuilding Exeter after World War Two, suggested that 23 out of the 24 houses could have been salvaged, restored and reused (clearly he hadn't anticipated the reconstruction of the single totally destroyed property.) In his book 'Exeter Pheonix', in which he outlined his vision for the post-war city, Sharp wrote enthusiastically about the quality of Dix's Field: "Mellow brick, cream-painted shutter-hung windows, handsome similar doorways, all repeated equally through the terraces of varying length - here was domestic building of the most civilised refinement and beauty." The photograph right shows the extent of Dix's Field c1900 overlaid onto an aerial view of the same area today. Paris Street runs from left to right across the top of the image. 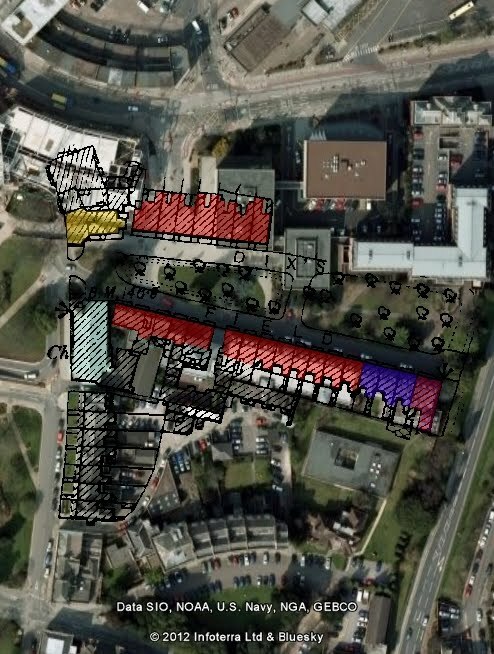 The 20 townhouses which no longer exist are highlighted in red. The three surviving houses are highlighted in purple with the reconstructed house next to them at the far end of the row. The site of the Regency house at No. 1 Dix's Field is highlighted in yellow. Despite the damage which Dix's Field sustained in 1942 Sharp supported its restoration: "The blitz brought only ruin, not annihilation. The walls of many of the smooth-fronted finely-proportioned buildings still stand" (as indeed they had in Bedford Circus too, although by the time Sharp surveyed the city the local authority had already pulled down all of the Circus's partially-damaged townhouses). Sharp continues: "They are gutted, smoke-blackened, and their window voids gape open to the sky - but at least the shells remain. Here it would not be a matter of rebuilding, but of repair and rehabilitation. Restoration would be entirely justified." The city council weren't having any of it. Aerial photographs show that the gutted shells of the houses remained standing until the late 1950s and then, in an act of gross vandalism, the city council bulldozed all of the fire-damaged properties. Thomas Sharp himself remarked that despite Exeter having such "distinguished Georgian and Regency architecture", the buildings were "not once mentioned" in the city council's pre-war guide to city. But that wasn't the end of the demolitions. 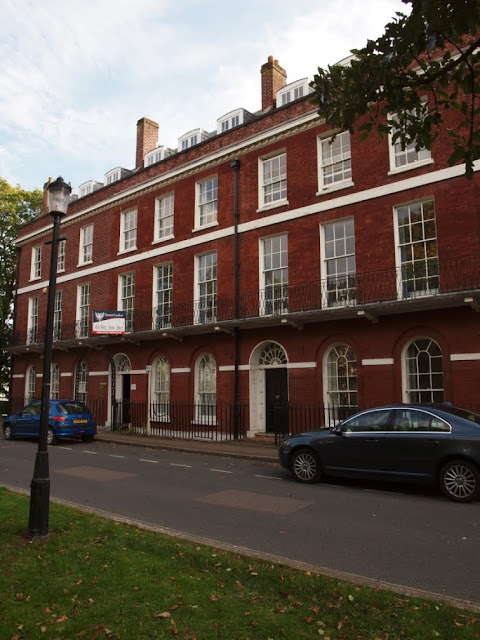 The three townhouses in the southern terrace which survived were kept and are now Grade II* listed buildings (although Hugh Meller believed that they had been "over-restored"). The last in the row was rebuilt completely, as mentioned above. The three intact townhouses in the north terrace were also granted Grade II* listed status on account of their importance, but they weren't to be so fortunate. These three houses remained intact until 1969 when they were demolished to build the city council's headquarters: the Civic Centre. And then, having bulldozed the sixteen gutted houses of the south terrace, a cheap pastiche of three of the destroyed facades was constructed on the same spot using modern bricks! 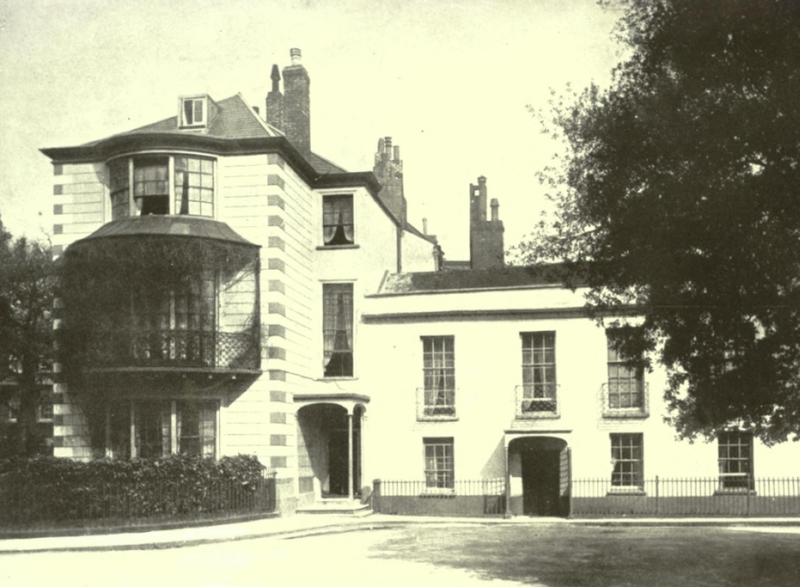 The photograph above shows, from right to left, the three pastiche facades, followed by the three surviving houses and finally the rebuilt house at the far end. And this is now the sum total of the Georgian remains in Dix's Field. Bedford Circus was damaged in 1942 and only totally destroyed afterwards. 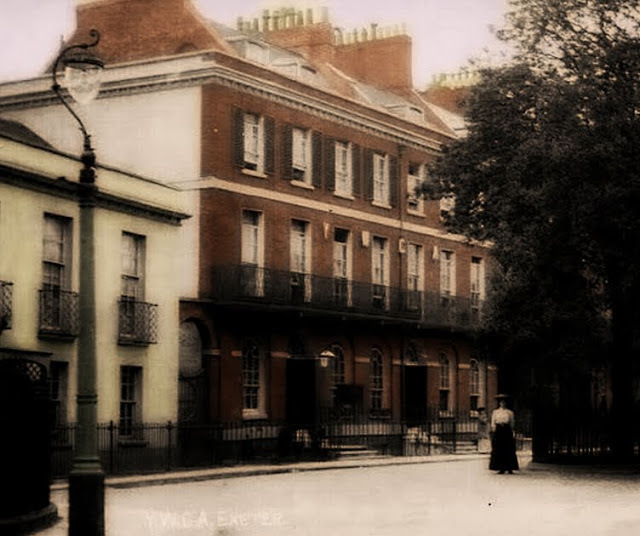 The two Nosworthy terraces in Southernhay West were damaged in 1942 and only totally destroyed afterwards. Dix's Field was damaged in 1942 and only totally destroyed afterwards (four houses excluded). Apart from those four houses in Dix's Field and one or two in Southernhay East, the city council's plan for the post-war city obliterated the Georgian remains of everything else. On the site of the north terrace of Dix's Field the city council built its headquarters: the Civic Centre, designed by Vinton Hall and constructed between 1969 and 1972 for the enormous sum of £1,000,000. The Civic Centre consists of two cubes fabricated from concrete panels, one larger than the other. Its monumental scale is totally at odds with the city and it's difficult to think of a less appropriate building for its site (although the old Debenhams building, Renslade House and Concord House in South Street spring to mind), but I think they have an austere beauty of their own, especially on a summer's day. 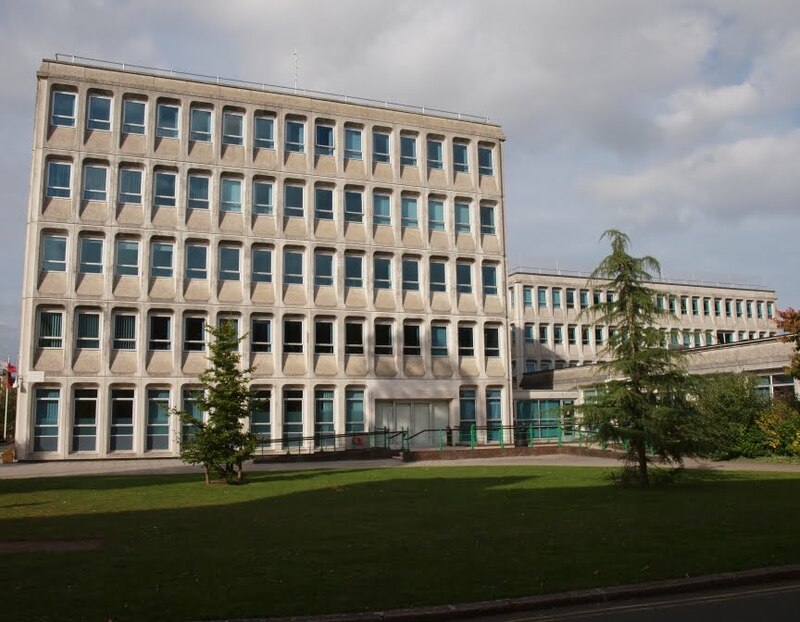 Whereas everything else built since 1942 now looks dated and tatty, the Civic Centre has retained a freshness and modernity that sets it apart, especially when compared with the above-mentioned old Debenhams building. It's deeply unfortunate that the remnants of Dix's Field were demolished in order to build it. It's impossible to walk past the Civic Centre today and not think of the truly beautiful red-brick terraces that once stood here.